♥ Do you know you would feel better, eat less and appreciate food more by slowing down and paying attention to your meals but can’t seem to actually do it? ♥ Are you exhausted from trying to diet or change what you eat? ♥ Would you like to transform your eating from the inside out? 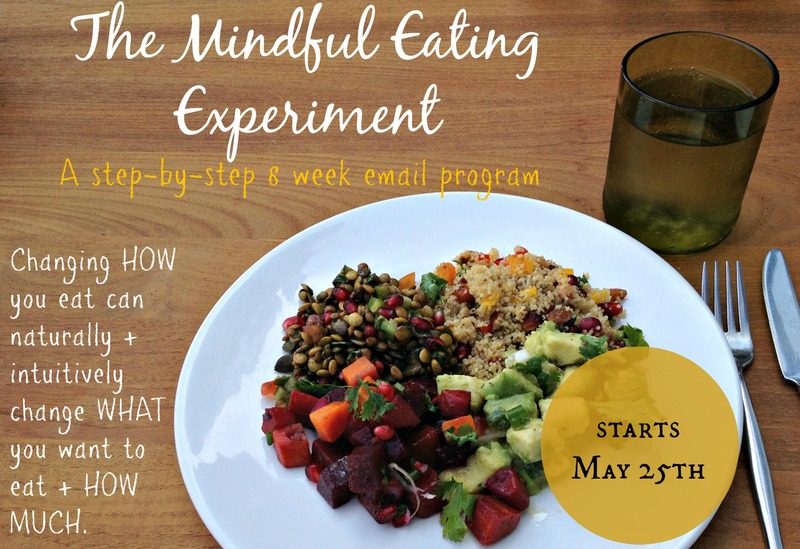 The Mindful Eating Experiment is a step-by-step 8 week email program with 1 simple technique shared every week so you can transform your eating from the inside out. It is a different approach to losing weight, dealing with cravings/overeating or simply adding more pleasure to your meals. By simply being more present to your meals, you can reduce overeating by up to 30%, eliminate cravings, boost metabolism and nutrient absorption. This program allows you to experiment with a total of 8 simple techniques which you can use wherever you are and whatever you are eating. You will experience how changing HOW you eat can change WHAT you want to eat and HOW MUCH more effectively than willpower or deprivation. Why a Mindful Eating Experiment? When you view this as an experiment, you create the ideal mindset for making healthy change. You approach Mindful Eating with curiosity instead of judgement. You realize you can’t fail – you are simply trying out a new way of eating. Even if you forget 5 times and remember the next time, it’s OK. What I personally love about Mindful Eating is it is not an all or nothing approach. Adding even just a little more mindfulness to meals can already make a difference. ♥ 1 email + video every Monday for 8 weeks that includes a practical & easy to apply action step. ♥ 30 minute Skype session with Hiba any time during the 8 weeks. Because my own experience with eating even just a little more mindfully has been so incredible. I was a sugar addict with frequent digestive issues and weight to lose. Yet even after making changes to what I ate and eating more healthy, I felt something was still off. I started researching Mindful Eating, and decided to experiment to see if it would help. Even when I managed to eat just a little more mindfully, my digestion felt a lot smoother and I was able to be satisfied with less food. Most impressively, and thanks to other changes I had made, I no longer had sugar cravings. By really tasting certain ‘unhealthy’ foods I thought I loved like M&M’s, I realized my body didn’t actually like the taste. I also started noticing the complexity of taste in simple, real food like a walnut or date. My wish with this online program is to provide a way for you to integrate Mindful Eating in a simple step-by-step approach with the support you need to make it a natural part of your meals. By the end of the 8 weeks, you will have painlessly created new habits that will help you have a healthier relationship with food. Are you ready to transform your eating from the inside out? COST: 80 CHF, including 8x emails + videos/audios + unlimited email contact + 30 minute Skype session with Hiba (Psychologist + Food Coach) to be used anytime during the program. If you would prefer to pay by bank transfer or are having trouble paying with PayPal, please contact me! “It was a pleasure to follow Hiba’s Mindful Eating Online Programme! Each week you got plenty of time to prepare for, consider and implement the task proposed. There was no pressure and if you had any questions Hiba was there with useful suggestions, support and thought provoking reflections in a calm and helpful way. Personally I did the programme alongside a renewed effort to make subtle but meaningful changes to what I eat and feed to my family to improve our overall health and attitude to eating and nourishment. By focusing on the taste of food, I found over the eight week programme that my already diminishing taste for sweet things almost disappeared, overall, I ate less, enjoyed food more and really did not want to eat things without appreciating them.